Alexander Yule Consulting Blog : Melanoma immunotherapy: Can vaccines and cell therapies expand on immune checkpoint inhibitor successes? Melanoma immunotherapy: Can vaccines and cell therapies expand on immune checkpoint inhibitor successes? Tracking the major cancer meetings has kept me occupied throughout October and into November but left me with plenty of material for this, and future, blog articles. A presentation at the UK’s NCRI conference on the increasing mortality rate from melanoma in men (but not women, where mortality rates are generally declining or stabilising), while alarming, did remind me of just how far melanoma treatment has advanced in a few short years. Prior to the availability of anti-CLTA-4 and anti-PD-1 immune checkpoint inhibitors, overall survival from metastatic melanoma in developed countries was around 25% after three years: combination immune checkpoint inhibitor treatment has stretched this to over 60%, and use following surgery (“adjuvant” use) significantly improves recurrence free survival. Despite these successes, a significant need remains for alternative treatments for those who fail, or are intolerant of, current immune inhibitor checkpoint regimens and a gamut of investigational immunotherapies including “personalized” or “individualised” peptide and mRNA therapeutic vaccines, cell therapies and oncolytic virus therapies are in active clinical development. That the immune system recognises melanoma as being “not self” has been known for decades and means of usefully exploiting this distinction long precede the discovery of immune checkpoints. Attempts to effectively boost the anti-melanoma immune response through injection of the Bacille Calmette–Guérin (BCG) tuberculosis vaccine were made in the 1970s, with mixed success. The potent immunomodulators, interferon alpha (IFNα) and interleukin 2 (IL-2), were approved for use in melanoma in the 1990s and still have a role in the treatment of metastatic disease and adjuvant therapy. 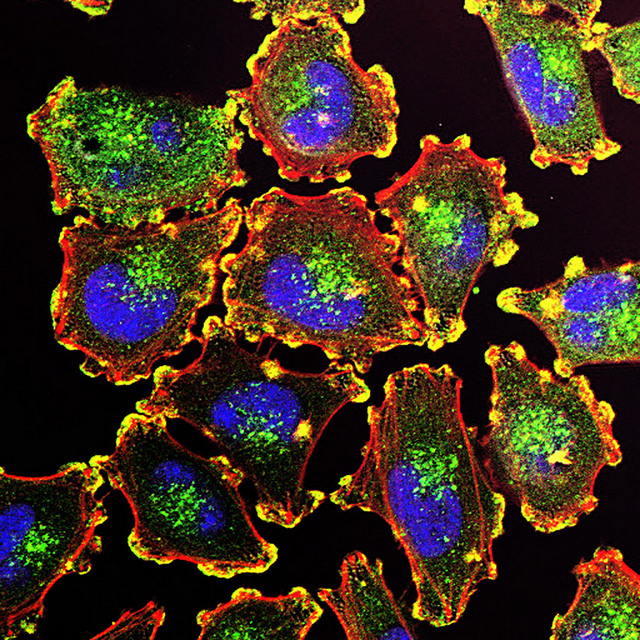 Melanoma has long been an attractive target for cancer vaccine development. A variety of melanoma antigens common to a majority of tumours - “tumour-associated antigens” (TAAs), including gp100, GM2; tryosinase, MART-1 and MAGE-A3, have been exploited, either alone or in combination, in cell-based and peptide therapeutic vaccines. Cell-based vaccines (as either intact or processed tumour cells or as cell-free lysates) offer the advantage of presenting a spectrum of TAAs, although neither patient-derived (autologous) nor cultured tumour cell-derived (allogeneic) cell-based melanoma vaccines, such as Melacine® (GSK/Schering) and Canvaxin® (CancerVax/Serono), have made it through pivotal studies. M-VAX (AVAX), a chemically-modified autologous cell vaccine, has been in late-stage development limbo for over a decade. Historically, peptide vaccines have fared no better, with a pivotal study of Oncophage® (Antigenics), the manufacture of which involved isolation of heat shock protein-peptide complexes from autologous tumour cells, being abandoned, and a Phase III study of a MAGE-A3 peptide vaccine (GSK) being terminated due to lack of obvious efficacy over placebo. Adoptive cell transfer (ACT) involves the collection, isolation, ex vivo expansion and (re)-infusion of autologous tumour-associated cytotoxic T-cells. ACT using tumour-infiltrating lymphocytes (TIL) has occasionally attained response rates of 40%-50% and complete remission in 10% to 25% of patients with extensive metastatic disease: however, the complexity of ACT has essentially confined it to clinical studies and compassionate use. As is the case with other cancer indications, decades of disappointment and inconsistency have not curbed the academic and commercial pursuit of effective melanoma immunotherapies. Applying recent advances in technology- next generation sequencing; gene transfer and editing; nucleic acid delivery- to melanoma vaccine and cell therapy development might just make these old dogs capable of new tricks. Cancer vaccine efficacy is blunted by the immunosuppressive tumour microenvironment: combination with immune checkpoint inhibitors is an obvious means of increasing the odds of success and a number of studies combining therapeutic vaccines with anti-PD-1 or anti-CTLA-4 immune checkpoint inhibitors are underway. These agents may eventually be joined or replaced, by one or more of the “next wave” of immune-oncology drugs directed at LAG3, CSF1-R, GITR or at targets in the innate immune systems which can fire up the immune response. Imlygic® (T-VEC: Amgen), an oncolytic virus therapy is“vaccine-like” in effect, activating both the innate immune system and revealing hidden tumour antigens (“neoantigens”) to the adaptive immune system through tumour lysis. Combination with ipilimumab has shown improvement in response rates over Imlygic® alone, and a Phase III combination study with pembrolizumab (KEYNOTE-034) is ongoing. Early-stage studies of CAVATAK®, an investigational virotherapy acquired by Merck & Co from Viralytics earlier this year, has shown promise when combined with either pembrolizumab or ipilimumab. The application of next generation sequencing technology and bioinformatics could offer a practical route to bespoke melanoma vaccines, with antigen selection and vaccine composition being determined by tumour and patient genetic makeup. Neon Therapeutics is currently trialling a synthetic peptide vaccine (NEO-PV-01) using sequencing of tumour biopsy material to formulate a selection of up to 20 peptide-mimicking patient-specific neoantigens. NantBioScience is pursuing a similar personalization strategy, with expression of patient-specific neoantigens in yeast cells (YE-NEO-001). The in vivo expression of melanoma (and other cancer antigens) through the introduction of the corresponding mRNA sequence is receiving increasing attention. Lipid complex mRNA vaccines, encoding multiple melanoma TAAs or a personalised selection of antigens, are now in early clinical studies (Lipo-MERIT and RO7198457: BioNTech). mRNA has brought a new twist to dendritic cell (DC) vaccination, where DCs isolated from the patient are loaded with melanoma antigens to optimise their processing and efficiency of presentation to the immune system. eTheRNA’s TriMix technology combines mRNA encoding melanoma antigens with mRNA encoding proteins known to enhance DC activation and maturation and to promote both helper and cytotoxic T cell production. Durable clinical responses have been achieved in melanoma patients who had failed previous treatments when the TriMix-DC-MEL vaccine was administered in combination with ipilimumab. Gene transfer may open up additional ACT strategies for melanoma. T-cell receptor (TCR) gene transfer allows the generation of antigen-specific lymphocytes from patient T-cells Early studies with melanoma antigen-specific TCRs have shown modest response rates, although several have been marred by severe adverse events due to the “off-target” destruction of normal melanocytes. The utility of ACT may be significantly improved through chimeric antigen receptor (CAR-T) technology, where T-cell antigen receptors are engineered to combine binding, signalling and co-stimulatory domains. Pilot CAR-T studies are underway. Improvements in TIL ACT may be possible by using CRISPR-CAS9 gene editing to increase the ability of T-cells to home in on tumours. Next generation cell therapies, including DC vaccination, are likely to benefit from the broader expanding commercial interest in CAR-T and TCR therapies which will likely lead to further improvements in manufacture and assist in establishing the logistics necessary to delivery patient-specific treatments. Growing use of semi- or wholly-automated cell product processing will ultimately reduce costs and make the treatment of larger number of patients viable. Effective melanoma immunotherapy had been a long time in coming, but as immune checkpoint inhibitor therapy has shown, revolution is possible. Experimental melanoma immunotherapies still have a lot to prove, but with the aid of across the board advances in immuno-oncology and other disciplines, we may finally see vaccine and cell-based approaches becoming practical and valuable treatment options.